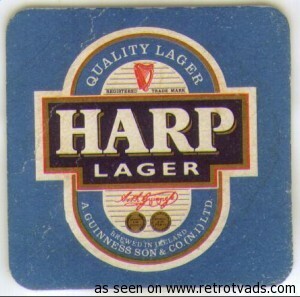 Harp Lager was first produced in 1960 as a bottled beer by the Guinness company (now Diageo), in response to the trend among drinkers in Britain and Ireland towards continental lager. Guinness converted its Dundalk brewery into a modern lager production plant with the guidance of Dr. Herman Muender, a distinguished German brewer. Various names were considered for the brand, including Atlas, Cresta and Dolphin, before Harp was chosen. The brand was marketed with the Brian Boru harp as its emblem. The manufacturer states that Harp is made with pure water from the Cooley Mountains, Dundalk. By 1961 a consortium of brewers, Courage, Barclay & Simonds, Scottish & Newcastle, Bass, Mitchells & Butlers and Guinness, grouped together as Harp Lager Ltd to brew and market the beer. Courage’s Alton Brewery, where Courage Director’s had been brewed, was rebuilt to produce the lager in Great Britain.